For some 3000 years the ancient Egyptians buried their dead on the edge of the western desert - it has been estimated that from the period of the Old Kingdom up to the Christian era that 150,000,000 to 200,000,000 people (at perhaps a lowest estimate) would have been buried in Upper Egypt alone - these were have been buried in tombs in the desert alongside the Nile (200 million bodies in a strip of land about 450 miles long). The type of tomb employed by the ancient Egyptians evolved through the ages - from the beginnings of a simple hole in the ground to the purpose built mortuary chapel-tombs of the New Kingdom, the Egyptians were looking for the best way of not only housing their dead but providing means for the living to honour their dead relatives. First appeared as a simple hole in the ground which was just large enough to hold the body of the deceased and a few grave goods. 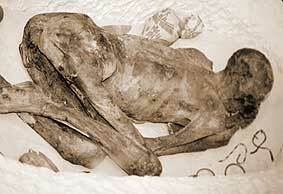 When the sand was covered back over the body the drying process caused by the sand produced the first mummies and would in turn start the Egyptians on their artifical mummification proceedures. Although more sophisticated tombs would appear later in the dynastic periods, this simple pit grave would continue to be used for the burials of the lower classes. The pit-graves would evolve slightly over the years - even by the end of the Pre-Dynastic period the pits would have a lining of wood or stone, a roof and then small chambers were added. A Large number of pit graves from the early dynasties may be found as satellite burials around the larger tombs of royalty or nomarchs (some pit graves found at Saqqara have small brick structures above the ground, pointing the way to later mastaba tombs). In the New Kingdom the covering of the bricks over the pit grave altered slightly to that of an arch, a rough vaulted roof or similard designs. Nubian people found in Egypt during the 2nd Intermediate Period / early 18th Dynasty were buried in a shallow pit in the desert - however these graves do vary from the Pre-Dynastic Pit-Graves and are so known as 'Pan-Graves'. These type of tombs first appear in the Predynastic period when they were used to protect the burial of Kings (the form of the mastaba at this time were limited to oblong heaps of stone which would cover the grave). The mastaba would alter very slightly in the Old Kingdom to become heaps of stone covered with flat blocks - these blocks were still just a covering for the real tomb - the body was still buried in the ground, a narrow shaft would lead down to a small chamber in the rock - it was here that the body would have its final resting place. After the burial the chamber was sealed and the shaft was filled with rubble - the mastaba would then become the focal point for friends and relatives of the deceased to bring offerings for the KA and recite magical formulae. Part of the decoration of the mastaba was the important false door - this would be the place that the relatives would come to bring their offerings and recite the formulae - this false door was usually on the east side of the tomb (so the living would be facing west into the land of the dead), on the more simple mastaba tombs the false door would be on the outside wall, on the more elaborate tombs a small chamber inside the tomb held the false door (also a second small chamber separated from the first by a wall, sometimes this wall would have a small hole. This room- the Serdab - held a statue of the deceased, the KA could then inhabite the statue while the offerings were made). 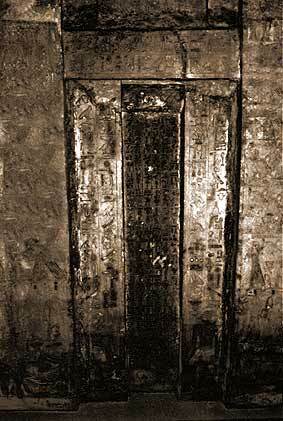 The false door was covered with inscriptions and pictures relating to the deceased and his life (titles, details of estates, workmen and officials), but mainly with references as to the funerary worship of the deceased. More often than not, the burial chambers of Mastaba tombs would have been robbed in antiquity - and so knowledge of the earlier forms of burial in ancient Egypt is limited. The deceased would have been buried in a large sarcophagus which in turn somtimes would hold a wooden coffin - the mummy would sometimes have a cartonage mask as well as the head rest the person would have used in life. The chambers found in the mastaba structure itself are frequently found to contain inscriptions (names of various gods and the deceased), inscriptions relating to Anubis (so that the deceased may have an easy passage to the Underworld and have an eternal supply of funerary gifts) are found above the entrances to the tomb and on stelae in the upper chambers. 1. Biographical (here the deceased is shown hunting or fishing, boating , listening to music and havind women dance for him, and also his official duties in life - as an overseer of a building project or during the harvest). 2. Sepulchral (the journey to the Amduat, the deceased with tables of offerings). 3. Funerary Gifts (scenes representing agricultural labours, making of wine etc).